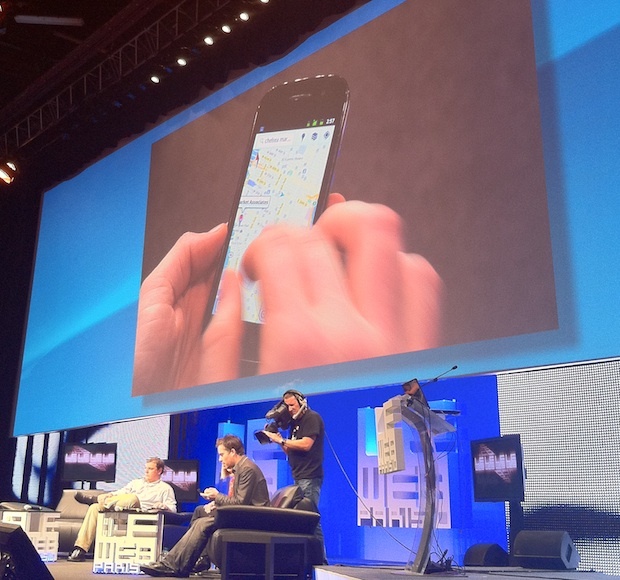 Today at LeWeb ’10 in Paris, France, our own Michael Arrington took the stage to talk with Google’s Marissa Mayer. Mayer recently took a new job within Google. Technically, she’s now the head of consumer products for the company. So what’s she working on? Well, as we’ve all heard, location is a big part of it. But she’s also thinking about a bigger picture item that Google is still working on. This is what Google is calling “contextual discovery”. This means being able to look at either a person’s browsing profile or their location profile and serving up interesting data to them without them searching for anything. Yes, it’s Google results without the search. “The idea is to push information to people,” Mayer said. She noted that on mobile devices this is particularly interesting because location can provide context. One example she gave was a menu when you’re in a particular restaurant. It would be great to show up and see that on your device — maybe with a bit of social flavor based on what your friends like, she added. Mayer said they’re still thinking about how the UI for all of this should look, but they have some ideas. It may be a panel in the browser. But on mobile devices it would be different. She said they they have a couple of things they’re currently experimenting with and that we should expect something to come from them in the next year or so. “We’re trying to build a virtual mirror of the world at all times,” Mayer said. MM: We’re calling it consumer products broadly. Local Search, Maps, Earth, Latitude, and all the local products. But it’s also contextual discovery. Take a users location as a piece of context for finding what they want without them actually searching for anything. We have a couple of things we’re experimenting with, but it will be out in the next year. MA: Why give up search and do something different? MA: Let’s talk more about contextual discovery. MM: The idea is to push information to people. It’s location in context. Inside the browser and a toolbar, can we look at where people have been going on the web — then we deliver it. But it’s a big UI challenge. In the browser it might be a panel on the right or bottom that complements your browsing. On the mobile phone, it’s where you are in the physical world. We can figure out where the next most useful information is. In a restaurant maybe it’s a menu. Or maybe it’s a social menu. It’s about explicit and implicit location. MA: Latitude is one of your products. Can we just agree that it’s pretty terrible? MM: (Laughs) I use it. MA: But you are an avid Foursquare user. MM: I am. But Latitude is useful for a smaller group of people. Only a handful of people you’ll want to know where you are at all times. There will be new layers coming on top of it. It’s more useful when more people are on it. And implicit and explicit — yes, the check-in. Maybe that’s in Latitude or maybe it’s in Maps. MA: You launched Latitude on the iPhone right? We saw it. MA: There are three big acquisitions that Google has been involved in in the past 12 months. Yelp, Twitter, and Groupon. You don’t have to confirm. But why has Google failed to get these companies? Is all the luster gone? MM: I can’t comment on any instance. But every deal is different. The larger the company, the more complicated the deal is. Slide is an autonomous inside of Google, for example. MA: What is HotPot — a Yelp killer? MM: No, it’s a recommendation engine. It’s built into Maps for mobile and Places. You can go to restaurants and rate them quickly. And you make connections with friends or other users like you. We try to produce good recommendations for you. It’s collaborative filtering plus the social component. MA: Do you remember Buzz? I didn’t mean it like that. MM: I don’t think Buzz was really similar, this is the new way to rate things for Local. MA: So Google Social, +1, can you confirm that? MM: It’s clear that social is important to Google. We need to work on it. MA: But if you mess up again… Do you just turn into Microsoft while you watch Facebook rise? MM: It’s clear that it’s really important. We really want to get it right this time. That said, we’re really patient. There’s search, mobile, local, and social. We’ve gotten three right. We’re working on the fourth one. MA: How does Twitter play into the ecosystem. MM: It’s an amazing distribution mechanism. And a way to consume information. But it’s more about blasting it out. We use it for HotPot. Foursquare is great signal too — I just checked-in here. I just checked-in there. Twitter is a great product. I use it a lot. MA: Will acquisitions happen in your group in the next 6 months? MM: Absolutely. We’re on track for almost an acquisition a week. We do 1, 2, or 3 of those big ones a year. AdMob, ITA, those types of deals are always in the works. DB: We’ve been working on this device with Samsung for about 12 months. It’s a pure Google experience device. It’s the very best of Google and Android. MM: One of the key parts is Google Maps for Mobile. Now it’s Google Maps for Mobile 5.0. We have 100 million using Maps for Mobile now. DB: I can use a multi-touch gesture to get a 3D view. MM: This is vector maps. So we can smoothly pan and zoom. MA: What I like about it are the new wallpapers. You’re only selling this is U.S. or UK right? Anyway to get one elsewhere? DB: It’s only on pre-order in a couple countries. We’ll see after Christmas. MA: What is you ran Yahoo? MM: I think Carol has done a lot of smart things. The Bing search deal was smart — we wish it was us. But they’re doing a lot of things to flatten things out and stay relevant. MA: What about more Google investments? You did Zynga. What about Twitter. MM: Well gaming makes sense. But other things we’ll have to see. MA: You’re on the secret committee right? MM: Yes, The OC. That’s what we call it — the operating committee. It’s about a dozen people who have done a lot with the company. We help operate the company. I’m really proud to be a part of that. MA: You talk about killing products, investments, right? MM: Yeah, it’s true. All that stuff. MM: We’ve had a really exciting week. Nexus S. Gingerbread. Chrome OS. 120 million active users of Google Chrome. And the Chrome Web Store. MA: Isn’t that a fancy name for extensions? MM: Sort of, but they’re hosted on the network vs. on the client side. And they’re all HTML5. MA: What about Chrome OS vs. Android? MM: I think we haven’t really decided. We see a lot of promise in Chrome OS. We’re looking at it to be on notebooks right now. It’s not even netbooks anymore. And Android is going to tablets right now. But the form factor for either could work for the other. Like Google TV is built on top of Android. And the developer community is helping on both. MA: What about downloading Chrome OS to my MacBook? MM: Hard to say. I can’t speculate. Possibly. The big thing is that Chrome OS is super-fast. You open the laptop and it’s ready. I have one waiting for me when I get back.